The year was 1587, and the English inside the Pale – a fortified district around Dublin – were concerned about the Irish Chieftains whom they had not yet brought under their control – especially in Ulster. The Ulster clans were an independent lot, and something had to be done to insure their non-interference with Crown activities. One of the more powerful clans was the O’Donnell of Tyr Connail, the present day Donegal. One day, a trading ship sailed across Lough Swilly offering Spanish wines, and fine fabrics for the Donegal Chieftains and their ladies. Red Hugh O’Donnell, the 15-year old heir to the Tir Connail Chieftainship, was invited aboard to see the merchandise. Once on board, his guards were overpowered amd the young prince was taken prisoner. The kidnapping infuriated the Irish, but Lord Deputy Perrot told them that Red Hugh would remain alive, as long as the O’Donnells remained passive, and the young prince was imprisoned in Dublin Castle. Many things happened while Red Hugh lay imprisoned as a guest of the Crown. Lord Deputy Perrot was recalled to England, charged with treason, and condemned to the Tower where he died. The following year, the Spanish launched an Armada against England, which was scattered. Remnants of the fleet escaped north around Ireland but were sunk or driven onto the rocky coast by winds and heavy seas. The northern clans helped many survivors escape back to Spain, while nearly 10,000 of those found by the English were executed. So many administrators had been replaced that it was doubtful that anyone remembered a 15-year old red-haired boy who had been remanded to a cell in the bowels of Dublin Castle, but the O’Donnell’s had not forgotten their prince. The O’Donnell, Red Hugh’s heartbroken father, hadn’t forgotten either. He wanted to trade 30 Spanish sailors for his son, but Hugh O’Neill convinced him that one day they might need help from a foreign land, and the Spanish would remember their kindness. O’Neill, the Earl of Tyrone, had also been taken as a boy and raised by the English in the hope that they could groom a loyal Irish leader. He grew up in England, served with their forces, studied their politics, and learned their tactics; he knew the English as no other Irish Chieftain had. Then, on Christmas night in 1591, with young Art O’Neill, Red Hugh O’Donnell, now twenty-years old, made a daring escape from Dublin Castle. They made their way into the Wicklow Mountains. Days later, close to death, covered with snow, and embracing the lifeless body of his comrade in a vain attempt to keep him from freezing, Red Hugh was found by the great Munster Chieftain, Fiach McHugh O’Byrne. Red Hugh’s escape sent a thrill through all of Ireland: the heir of Tir-Connaill was safe. After many close encounters, O’Donnell made his way to Hugh O’Neill at Dungannon, who escorted him to The Maguire, Lord of Fermanagh. Hugh Maguire brought him home to Tir-Connaill, where in May, 1593, the young O’Donnell stood on the Rock of Doone, the ancient crowning stone of Clan O’Donnell, and received a title higher than any foreigner could give – that of The O’Donnell, Prince of Tir-Connaill. There were now two War Chiefs in Ulster; Hugh O’Neill decided to make it three, and he renounced the title, Earl of Tyrone, and took the ancient Gaelic title of The O’Neill. The English, worried by the audacity of the northern Chieftains, captured The Maguire’s fort at Enniskillen which guarded the Gap of the Erne – one of the two the main accesses to Ulster. Maguire called on The O’Donnell for assistance, and O’Donnell rallied his clan. Thus began the great rising of the Ulster Chieftains known as The Nine Years War. O’Donnell swept through Ulster driving the English before him. By the time they reached Enniskillen, Hugh O’Neill’s brother, Cormac had joined them, and Enniskillen was recaptured. The English attacked Monaghan, and again they were defeated, but this time, the banner of the Red Hand of O’Neill flew among the Irish; Clan O’Neill had taken the field against the English, and at their head was The O’Neill, England’s trusted Earl of Tyrone. The English were in trouble now for, the Irish had revealed their strength. The three Hughs were in command of close to 1,000 horse-soldiers and 7,000 foot, at a time when the entire English force in Ireland was less than 2,000. With Enniskillen safely in their hands, the three Hughs moved toward the Blackwater where an English Fort controlled the other main access to Ulster – the Gap of the North. The Crown sent Lord Ormond and a newly arrived army of 4,000 foot and 300 horse to reinforce Blackwater . The Irish decided to stop him at a ford in the callan River known, by the color of its banks, as the Yellow Ford. The O’Neill constructed defenses using his knowledge of English tactics, The O’Donnell organized a cavalry, and The Maguire, with the help of MacDonald gallowglass, set to block an enemy retreat. What happened next had never before happened in Ireland. On the morning of August 14, 1598, the English were outmaneuvered, outgunned and outfought by the Irish. The Queen’s army was destroyed, Blackwater Fort was in Irish hands, and all of Ireland stood open before their army of liberation. Elizabeth was not on the brink of losing Ireland; she had lost it, and would spend a fortune to regain it. She raised the largest force ever assembled – 25,000 troops – and sent her Earl of Essex to lead them. But Essex delayed a confrontation with the three Hughs, instead losing more than a few men chasing Fiach McHugh O’Byrne into the Wicklow Mountains. Elizabeth demanded he attack north and in August he finally sent an advance force. That force was met and defeated by O’Donnell at the Curlew Pass near Boyle in Co Roscommon where a statue of O’Donnell commemorates that victory to this day. 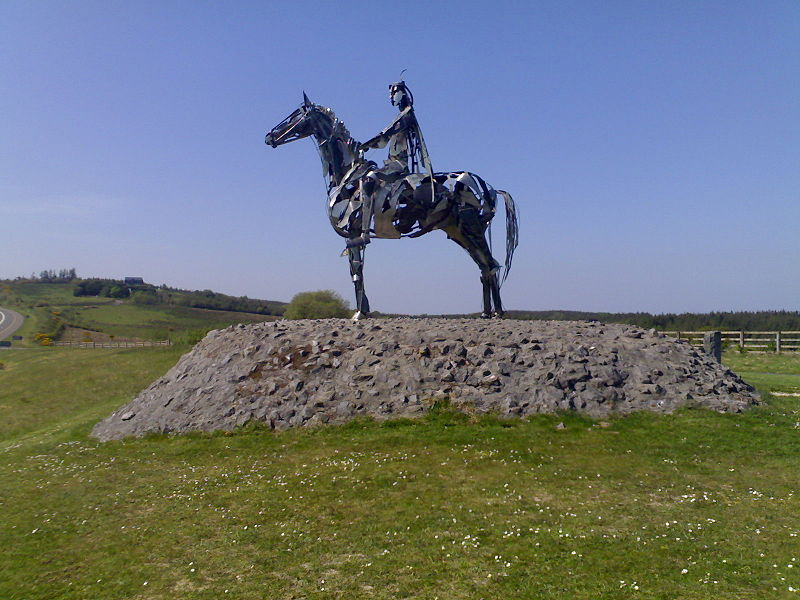 (Gaelic Chief Statue) In September, the two full armies met in Louth, and O’Neill called for a parlay. The two leaders met on horseback in the middle of a stream at the Ford of Bellaclynthe. What was said will never be known, but when it was over, Essex turned his army south and returned to Dublin. He had granted O’Neill a truce! A furious Elizabeth publicly called him a coward and Essex secretly left for England, deserting his army, to plot rebellion against her. Whether O’Neill had proposed such a strategy during their meeting is not known, but he was playing the politics of the time by avoiding conflict with Elizabeth. She was, after all, an old woman, and couldn’t last much longer. He had been negotiating instead with her successor, James Stuart of Scotland, and may well have offered Essex some position in the new reign in return for a truce until Elizabeth’s death. The only obstacle between O’Neill and the Kingship of Ireland was a frail old woman who would not give up. In England, Essex’s unsuccessful rebellion won him a suite in the Tower of London until a clumsy executioner took six blows to sever his head. As O’Neill awaited Elizabeth’s demise, she continued to send supplies and men until she found the leader she was seeking – Charles Blount, Lord Mountjoy. A ruthless field commander, he would turn the tide in Ireland. In 1601, Mountjoy arrived in Ireland and began a scorched earth campaign, destroying everything before him. O’Neill asked for Spanish aid and a force arrived at Kinsale, but Mountjoy bottled them up. The Irish raced south only to find English siege lines between their weary army and the Spanish. The Spanish attacked, drawing the Irish into the battle which lasted for 3 months. It was fought in trenches where the superior Irish mobility and O’Donnell’s cavalry were useless. The Irish were defeated, leaving over 1200 dead, including The Maguire, countless wounded, and close to 1,000 captured and hanged. Kinsale was the most decisive battle in Irish history. The new Irish nation was dealt a mortal blow in its infancy, but Red Hugh was not about to give up. He went to Spain to arrange for more aid as O’Neill withdrew to Ulster, waiting for Elizabeth to die. Mountjoy continued to ravage Ireland and famine, plague and lawlessness were rampant. When Mountjoy learned of Red Hugh’s mission to Spain, he sent an agent to stop him. At a dinner in Samancus Castle on September 10, 1602, the 30-year old Prince of Donegal was mysteriously poisoned. He was buried in a Franciscan Monastery in Valladolid that was demolished in the 19th century and time has erased all trace of the young Prince’s grave. When O’Neill heard of O’Donnell’s death, he knew that all was lost and asked for terms in order to end the slaughter of his countrymen in the nightmare that Ireland had become. In return for surrender of his forces and arms, he would be reinstated as Earl of Tyrone with a much diminished estate. He agreed and the last of the three greatest Irish Chieftains of their age came to Mellifont Abbey to pledge obedience to the Crown on April 1, 1603. On April 3 he was humiliated again at a ceremony of submission at Dublin Castle. Only then was he told: Elizabeth of England had died on March 24! James Stuart was now James I of England. O’Neill had won and never knew it. The Irish had outlasted the Queen only to be tricked into submission by Lord Mountjoy before any agreements with James could be ratified. The Maguire had been killed at Kinsale, The O’Donnell had been poisoned in Spain, and O’Neill had surrendered the Irish army and their arms. There was nothing left to do. Most historians agree that this is the point at which the old Gaelic system of law and government was finally broken. But though it was ended, it was not forgotten. More than 350 years later, after independence was won, and the Republic of Ireland established, the Irish government sought a vote on establishing a national anthem. The voting was extremely close, and though the Soldiers Song was selected, the song that almost beat it as the national anthem of the Irish people, was a song written in tribute to the last War Chieftains of the old Gaelic Order. It is also the official song of the AOH in America. It’s called O’Donnell Abu.